This past weekend I visited Toronto, Ontario and had many fun/exciting "Escapes". On Friday evening I attended a fascinating play with much relevance for us. It was at the Young Centre located in Toronto's historic Distillery District. A little piece of trivia: Before the term transvestism was used, the process of "men who dressed as a women, adopted feminine mannerisms, clothing, etc" was called Eonism. This, in a way recognized the remarkable life of a Charles-Geneviève-Louis-Auguste-André-Timothée d'Éon de Beaumont; usually known as The Chevalier d'Éon. Also the largest and longest established transgender support group in the UK gives nod to d'Éon by going by the name The Beaumont Society. On their site is an extensive biography of Chevalier d'Éon. Wikipedia describe his life this way: Chevalier d'Éon, was a French diplomat, spy, Freemason and soldier who fought in the Seven Years' War. D'Éon had androgynous physical characteristics and natural abilities as a mimic and a spy. D'Éon appeared publicly as a man and pursued masculine occupations for 49 years, although during that time d'Éon successfully infiltrated the court of Empress Elizabeth of Russia by presenting as a woman. 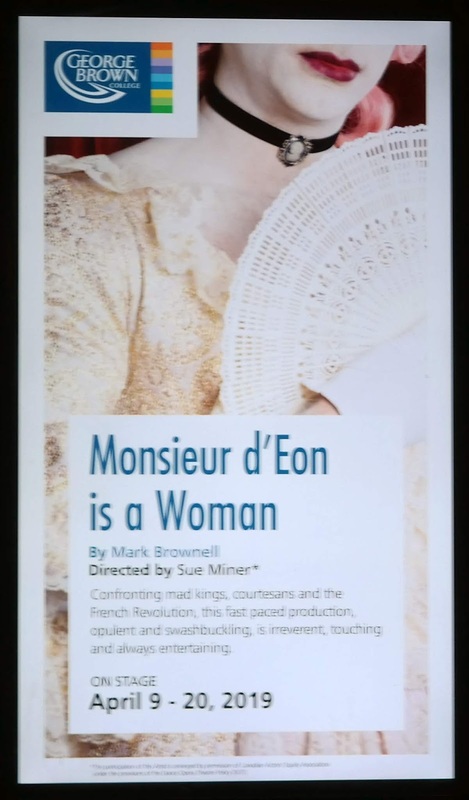 For 33 years, from 1777, d'Éon dressed as a woman, identifying as female. Doctors who examined d'Éon's body after death discovered "male organs in every respect perfectly formed", but also feminine characteristics. With fencing matches and intelligent dialog, the play cleverly left open as many questions as it answered. If you have not read several of the books available on Chevalier d'Éon's life, do. He lived a life full of narrow "escapes".